What do you get when you cross mode, median, mean, and range with a real snake and tall ladders? The Zapzapmath edition of Snakes and Ladders! In order to summon the snake, you need to find the mean. Mean is the average of a group of numbers. 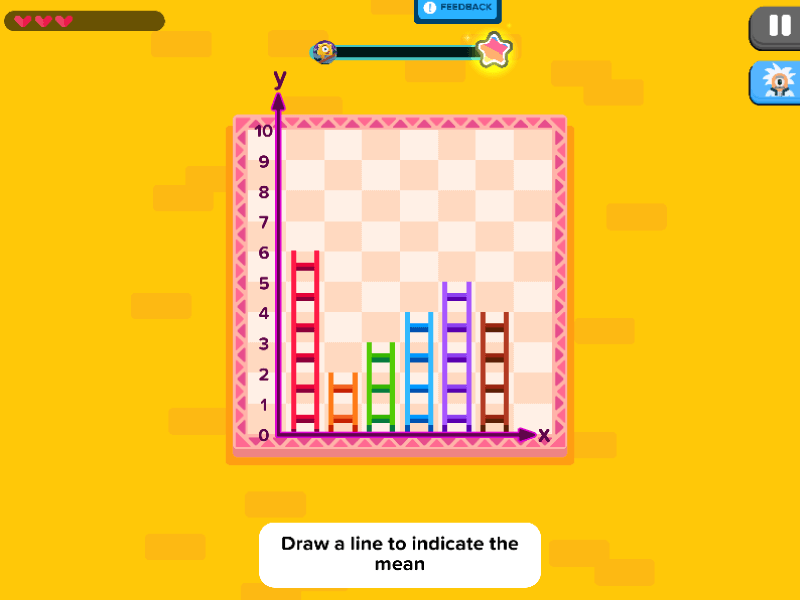 For instance, if the ladders lead to 1, 2, 3, and 2 on the graph chart, you need to find the average of those four numbers. You can do this by adding the numbers up: 1 + 2 + 3 + 2. Once you get the total, you need to divide the total by four (which is the number of ladders). In this case, the equation is (1 + 2 + 3 + 2) ÷ 4 = 8 ÷ 4 = 2. Thus, 2 is the mean. When the snake is summoned, it will slither its way across the ladders. This means it is time for you to roll the dice! You need to figure out the number of steps between the snake and the top of the ladders, regardless of whether the snake is above or below. Lock in each gap by tapping the die until it arrives at the number you need, and repeat this for all four dice. You can also calculate the gaps by subtracting the difference between the Mean value and the total steps for each ladder. Then comes the final, nail-biting step to winning this game! To be declared victorious, you need to find the mean absolute deviation. Mean absolute deviation is a way to describe variation in a data set. You can obtain this answer by adding the four dice together, and dividing the total by 4, which is the number of ladders in the game. The right final answer will have everyone shouting a celebratory cheer, while the wrong answer anywhere through the process will have you stuck to your spot on the board. So master your calculations of the mode, median, mean, and range, and you'll be mastering this game in no time! Snakes and Ladders is a game that practices statistics and probability. By learning to define the mode, median, mean, and range, you are forming a strong understanding of statistics and how to define data. Though the subject is a hard one to master, the gameplay of Snakes and Ladders allows you to casually get acquainted with statistics comprehension through a clean and neat breakdown of formats that conclude into one complete group of data. Are you game for Snakes and Ladders?